Dental health during the holidays is not easy. The season is often filled with parties and other social gatherings. While these festivities are a lot of fun, they can also lead to eating heaps of sweets. It’s important to take care of your oral health during the holidays. To help you out, A Supa Smile has partnered with Santa to come up with 12 tips for maintaining your dental health during the holidays and beyond. We suggest 4 great ways to make an advent calendar dental-smart as well as 8 tips to make your holiday seasons healthy and happy for you, your loved ones, and everyone’s teeth! Together we can make this holiday festive, fun, and full of healthy smiles! A Puzzling Treat – Give your child the fun of a customized puzzle. Draw a picture or write a special message on a blank puzzle. Break the pieces apart and place one puzzle piece in each day of your advent calendar. As the month goes on, your child will slowly see the puzzle come to life! Sugar-Free Trinkets - Find some simple trinkets to fill each day on your calendar instead of candy. The dollar store is a great place to start your search. Keep your hands busy. Christmas normally includes vacations for children and adults. While this is a great time to relax, too much down time can mean overindulging in sweets. Instead of sitting around and eating, engage family members and friends in games or toys received during the Christmas holiday. Stay away from soda. Holiday parties are rife with soda and this sugary liquid is never good for your teeth. If you want something bubbly, try fizzy water rather than soda. If you must drink soda, use a straw to keep most of the acid off your teeth. Brush after every meal. When you brush immediately after having breakfast, lunch and dinner, you are less inclined to continue eating. Some families may come to the holiday table early in the day, so if you brush after the meal it creates time between the next sit-down, and you may not wish to munch in the space between. Set a Time Limit. It’s really tempting to graze all day during the Christmas season, but this puts our teeth more at risk of decay. Instead of leaving food out until all hours, set up specific times of the day to set the table for people to eat. It’s important that there is a definite beginning and ending to meals. A schedule helps keep everyone from constantly reaching for food that’s high in sugar and fat. Visit us at A Supa Smile. Dental cleanings are a key part of your oral health. 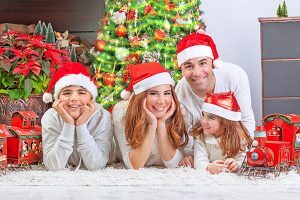 The Christmas holiday can be very damaging to a smile, so it’s important you give your teeth and gums the best chance of survival by getting a professional dental cleaning. Be careful with candy. Hard candies can crack your teeth if you bite down on them in the wrong way. Cracked or broken tooth can be painful and is a flaw to your dazzling smile. If you do eat candies, instead of biting, let them dissolve in your mouth. Also, be certain to brush your teeth after eating sugary foods of any kind, and only eat them in moderation, if at all. Offer Alternatives to Sweets. Sweet and sugary food and drinks activate the bacteria that live in our mouths. These bacteria feed off the sugar and produce acids that harm teeth. Instead of weighing down the Christmas table with cookies, candy and other Christmas favorites, make sure there’s a veggie tray with crunchy carrots, celery and broccoli. The natural crunch can help clean teeth in between sugar cookies. Protect your teeth during games. Wear a mouthguard whenever you play sports – or reindeer games – this winter. A Supa Smile will be happy to design a personalized mouthguard to protect your teeth! A Supa Smile is experienced in treating all kinds of dental issues. Our office is located just off of the Maroondah Highway with public transport nearby. For working patients we are open from Mondays to Fridays, morning until evening and on Saturdays until 3 PM. Emergency dental treatment is also available! Guaranteed same day dental emergency appointment for all our patients. Our dental practice in Croydon offers you the level of quality, caring dentistry that we would expect for ourselves. Call us on (03) 9723 0703 or book your appointment online!